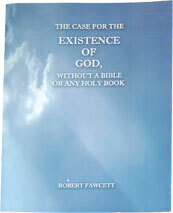 Special Reports on religion available from Robert Fawcett. PROFESSOR: How can you say you are an atheist (meaning, there is absolutely no God) when you agree that you have less than one percent of total knowledge? STUDENT: I guess I need to say I am an agnostic – I don’t know if there is a God. PROFESSOR: Are you a hard agnostic, or a soft agnostic? PROFESSOR: A hard agnostic says, “you can’t know if there is a God”, and a soft agnostic says, “ I don’t think there is a God”. STUDENT: I guess you would have to say I am a hard agnostic. PROFESSOR: Can you ever be sure that…you can be sure that there is not a God? Or, do you know for sure that…you can’t know anything for sure? STUDENT: No. I can’t say for sure that I can be sure there is no God. PROFESSOR: So, you’re really a soft agnostic. STUDENT: Yes, I guess that’s true – I don’t know if there is a God. PROFESSOR: You sound to me like a person who is saying, I have never seen any evidence that there is a God, so I don’t know if there is. STUDENT: That’s right. I have never been exposed to any evidence about…God…life…life after death…or the ultimate meaning of life. And, that is where we must start, with the question, Is there sufficient evidence for me to conclude that there is a God, and that I can have a personal relationship with Him?